Ever since the invention of the wheel, great ideas have not only been eclipsed, they have been stolen. The R. Hoe Company, once a mammoth builder of newspaper presses, had incredible scandals and court case. George Gordon snapped Stephen Ruggles ideas for a platen press then fought for years to protect his trumped patents. In more contemporary times, many German offset technologies have shown up elsewhere as near identical clones, which were eventually adapted to stand for their own quality. The passage of time allows us to learn valuable lessons about the evolution of printing technology. Take for instance the story of Mr. Henry Heyl and the Brehmer brothers. These three men had a major impact on the printing industry. One a gifted inventor, the others observant partners. Their story illustrates how little has changed in the way ambitious people, in pursuit of fame and fortune, live their lives. Henry Renno Heyl, an American, was born in Columbus, Ohio, around 1842, when America was an incubator of industrial innovation. In 1870, Heyl invented the world’s first device for projecting [moving] pictures on a screen. In front of 1,600 people, in Philadelphia, Heyl demonstrated his invention but never patented it. Well before Edison, the Phasmatrope showed a group of still images (himself and his niece) mounted onto a stereopticon projector. When the wheel holding the glass images rotated, the projector cast the images with candlelight onto a screen and created the illusion of motion. Heyl could be thought of as the father of the movie industry. Many other important printing innovations followed. A folding cardboard box machine was patented in 1871. Previously, almost all goods were wrapped in paper and tied with string. Heyl’s machine folded and glued a collapsible box and revolutionized what today is a major part of the industry. Perhaps we should also credit Heyl as being the father of the paper box industry too. Matchbox and tag making machinery was also invented by Heyl, who also received credit for fashioning the office stapler. All of this took place in Philadelphia. One giant book-making bottleneck caught Henry’s eye in the 1870s: Hand sewing of signatures. American Sterling Elliott had invented a device to pierce and thread pamphlets. It even tied a knot at the end stroke, but ultimately made bulky signatures terrible for case binding. Ellicott Averell from Brooklyn, NY, developed a wire stitcher in 1874. It was patented as the first machine to stitch book blocks onto a spine. Very little became of it, but the invention attracted many eyeballs, among them a Canadian. Louis Goddu was a shoemaker born in Quebec. Presumably noticing Averell’s machine, he made further inroads using wire. Goddu was a prolific inventor, patenting several automations (300 in total) primarily in the shoe industry, sewing, nailing and tacking machinery. He is considered as one of the early innovators of the staple. Working from his new home outside Boston, Goddu went on to build his own car, which included a first of its kind overhead camshaft. With a new material called drawn wire, the American industry soon expanded but mainly for flat stitching with single-head machinery. Even with the advent of wire staple, thread sewing was still being done by hand. Northern Irishman David Mc- Connell Smyth, who arrived in America in 1835 at age two, would eventually solve the thread-sewn dilemma. Though Smyth didn’t invent the sewing machine (Elias Howe, 1830s, patented in 1846), Smyth did move this technology into the bindery in 1867 (patented 1871). As pictures testify, the early days of stitching a signature with a Smyth sewer were daunting, but the machine eventually paved the way to a thread sewing standard in the industry. Even today we refer to a quality stitch as Smyth Sewn. It would be many years, however, before the massive book industry accepted the Smyth system, leaving a giant hole to be filled. Having already worked with drawn metal wire, Henry Heyl entered the scene because of the upcoming Philadelphia’s Centennial Exposition in 1876. He aimed to build a machine that would use metal wire instead of thread to automatically stitch a signature. Heyl wanted to produce a million copies of a special edition book for the Exposition. He modified a standard sewing machine to feed wire capable of making 1/4-inch staples at a rate of 50 per minute. The Centennial books were delivered on time. 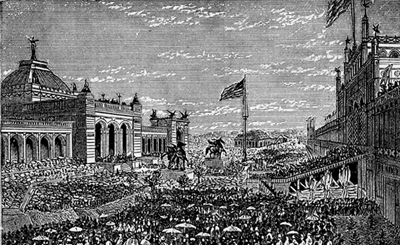 The Centennial Exposition, first official World's Fair in the United States, was held in Philadelphia in celebration of the 100th anniversary of the signing of the Declaration of Independence. Nearly 10 million visitors attended. Two brothers newly arrived from Germany, who owned a small Philadelphia machine shop, helped Heyl build his device, what would be referred to as the Heyl #2. Word about the breakthrough spread quickly and the U.S. Government Printing Office ordered 13 Heyl #2 machines, which also stitched signatures by alternating the pattern so that spines were much less bulky. Women could feed and stitch as fast as they were able. By 1881, more than 300 Heyl #2 machines were sold. The German Brehmer brothers were similarly talented machinists. Although both had immigrated to America in 1871 from Lübeck, they quickly realized the impact an automated stitcher would have in Leipzig, in the heart of Germany’s printing industry. The brothers severed ties with Heyl and, since they shared rights to Heyl’s invention, immediately began to manufacture the Heyl #2 under their brand: Brothers Brehmer. August and Hugo Brehmer had no previous experience in the printing or bindery craft before they met Henry Heyl. The brief partnership ended up robbing Heyl of his most important creation, as American-made Brehmer machines also made their way to England and France. August Brehmer left America in 1879 and headed straight for Leipzig, where he set up another company: Gebrüder Brehmer Maschinenfabrik. Hugo soon followed. The Brehmer Company had incredible success with a variety of bindery machinery. Two years after Smyth’s thread sewer breakthrough in 1884, Brehmer launched its first thread-sewing machine. Wire had proved to be a problem, as books began breaking apart or the wire rusted and stained the pages. No matter, the explosion of the Heyl/ Brehmer wire stitcher continued for many years, especially in Germany, for its cost much less than a thread sewer. Heyl had paved the way for the automated thread sewer. From Frank Comparato’s 1971 Books for the Millions, there is a reproduced letter written to Henry Heyl by an ex-Brehmer employee, Carl Louis Lasch. It’s a poignant reminder of how little business ethics have changed since 1876. I address you in regard to a matter pertaining to your patents for stitching machines. . . I was, for a considerable number of years, a foreman in a large tool machines manufactories, among others for nine years in the most important German tool machine manufactory of John Zimmermann in Chemnitz [Karl- Marx-Stadt] where I became acquainted with August Brehmer as a colleague. 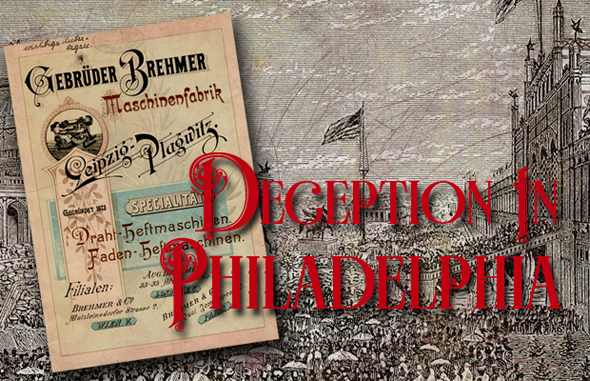 In 1876, I visited America as a member of the German delegation to the Exhibition in Philadelphia, visiting, at the same time, the principle American manufactories in my line and becoming acquainted with Hugo Brehmer in Philadelphia. When the Brothers Brehmer established themselves in Leipzig- Plagwitz, the position of foreman was offered to me, which I finally accepted, in order to make myself familiar with the work-methods of good American precedent. To my experience and to my acquaintance with the conditions of workmen here, the Brothers Brehmer are largely indebted for the rapid success which they obtained in the manufacture of the wire-stitching machines and of the machines for making paper boxes. The arrogance and insufferable dogmatism of Hugo Brehmer, however, made the position unpleasant to me. . . I have learned that the Brothers Brehmer are not the inventors of wire stitching for books, as they have boasted throughout Europe, but that this novelty which had made the Brehmers’ rich and famous as inventors in Europe is your invention . . . The Brothers Brehmer, who manufactured and sold [your paper fastener] in a somewhat changed form... You will see from this ambitious efforts of the Brothers Brehmer to adorn themselves even with borrowed plumes which are at least in part, the intellectual property of others and from which the Brehmers are enriched. Heyl went on to win numerous awards for many inventions and even won the Franklin Institute Medal in 1879. His name all but disappeared from printing industry records. When Heyl died in 1919 he was said to harbour no grudge against the Brehmers and remained a pioneer to the end. Gebrüder Brehmer became synonymous with the sewing machine, as well as wire stitchers and folders. From 1879 to 1940, Brehmer was the largest European manufacturer of bindery equipment. The model 381 sewer is still being bought and sold, serving as the basis of a new machine built today. In 1945, Brehmer found itself on the wrong side of the Iron Curtain and were rolled into the Soviet Bloc Kombimat – POLYGRAPH- VEB. After a short period as part of McCain Manufacturing, they were assimilated in 1994 by STAHL (now owned by Heidelberg). Today, it is a forgotten name, but once Brehmer, along with Smyth and latterly Martini, held exclusive hold on the book sewing industry. Copyright © 1967-2019 Howard Iron Works and Howard Graphic Group of Companies. All rights reserved.